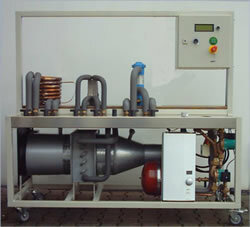 This rollable test stand allows profund studies on all influencing quantities in heat exhanging systems. It demonstrates the characteristics of four different types of heat exchangers: It enables counter-, parallel- and cross-flow connection. It uses water, air and steam. The electronic control system provides defined hot and cold water flow.